I don’t know if you have heard, but No. 1-ranked LSU and No. 2-ranked Alabama play on Saturday night. Unless you have been living in a cave or under a rock you’ve been hearing about this game for weeks, and the constant hum is rapidly turning into an avalanche of hype as the game nears. It’s the game of the decade — though it’s important to note that we seem to have a game of the decade pretty much every year. This game has some unique factors, though. For starters, this is hard to believe but it is the first time that No. 1 and No. 2 teams have met in the SEC. It’s also the first time that one and two have played in-season since Ohio State beat Michigan in 2006. This one has everything going for it. Nick Saban’s new team against his old one. Two ruthless defenses, solid offenses, and the two teams that seem to be clearly head and shoulders above all the rest in the country. The winner of this game will be in the express lane to the BCS Championship Game. Heck, if this game is close and they get a lot of help from other teams this could potentially be a preview of the championship matchup. Neither of these programs are strangers to the spotlight. Both coaches have won National Championships, and both largely with players recruited by Saban. Both teams are elite and constantly in the spotlight. Both squads are made up of highly-ranked recruits that have been under a national magnifying class since they were high school sophomores. What makes this situation somewhat unique, though, is the timing. It’s rare to see a game of this magnitude and hype played just days after kids are out trick or treating. We expect these in early December or early January, not now. That changes how teams and coaches have had to prepare for this one. The more interesting impact of that will come next week when these teams realize that they still have a lot of season left to play. You can break this game down position by position and find an edge here or there for each squad, but at the heart of it there is an ultimate truth — these are both really good teams. You could wish that they both had better quarterback play perhaps, but they can both move the ball, both score a lot of points, and both limit the capabilities of their opponents. When you are handicapping a lot of games you can point out a potential mismatch or two that makes the likely outcome clear. What makes this game so interesting is that those mismatches don’t leap out here. More than most games the winner of this one will be the team that is best prepared, the one that gets the best coaching on the day, and the one that gets the bounces on that day. There’s always part of every fan that wants to pretend that either team can win any game. That’s often not true, but it is certainly the case here. This is not likely to be like watching a typical game for either of these teams. In most games they play the game is over well before the clock ticks to zero. LSU has won six of their eight games by at least 26 points, and has won their other two by a comparatively tight 13. Alabama has won seven games by at least 24 points and the eighth by 16. Unless this game really fails to live up to the hype this game should be much closer than all those that have come before. Neither of these teams has really had to deal with any on-field adversity this year — at least not late in games — so we can’t really be sure how they will respond. Last week we saw that Stanford responded with determination and anger when they were threatened. The team that does a better job of showing a similar sentiment is the one that will likely win here. Betting volume promises to be huge for this one, and that’s already the case — there are more than four times as many bets on this game than any other as I write this. About two-thirds of those bets have been on LSU so far as bettors take advantage of a very rare opportunity to bet on the No. 1 team in the country as an underdog. The line first appeared at 3.5, but quickly adjusted to five, and has fluctuated within that range since, according to college football odds. The early total was posted at 43.5 and has since dropped as low as 41. LSU has covered six of eight spreads on the year, including their last three. Alabama has failed to cover just once all year, and has covered their last five. The road team is 11-3-1 ATS in the last 15 meetings in this rivalry. The favorite has gone 6-2-1 ATS in the last nine meetings. I have gone back and forth on this one several times. LSU has played a tougher schedule, though several teams they have played — most significantly Oregon and West Virginia — didn’t prove to be as impressive as originally advertised. Alabama has played some decent teams as well, so that’s not a real concern. Both have some issues at QB. Both are solid offensively and impressive defensively. In the end I’m going to go for the Crimson Tide for two big reasons. 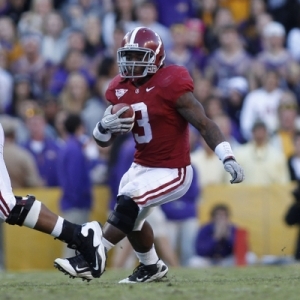 First, Trent Richardson leads a very potent rushing attack, and LSU could have some issues with that. It certainly could open up some opportunities for the Alabama offense. Second, and more significantly, I don’t like the guy, but I’d take Nick Saban over Les Miles any day. Miles is a very good coach, but Saban is an all-time great. If it comes down to coaching — and in games this tight it often does — then I’d much rather bet on Saban than Miles. That means I’ll find the smallest spread I can and jump on board for what should be a wild ride. Indian Cowboy has proven himself as one of the best NFL and college football handicappers in the nation. IC is very selective with his football picks and releases only three picks per week for college and pro ball. He has earned six of seven winning weeks for his selections, and he loves the card this week. Click here for more info.